The best introduction to skydiving! Here at JumpTN we are passionate about the sport of skydiving. We contract some of the best tandem instructors in the industry. Most of them have thousands of jumps and they are all held to the highest standards. 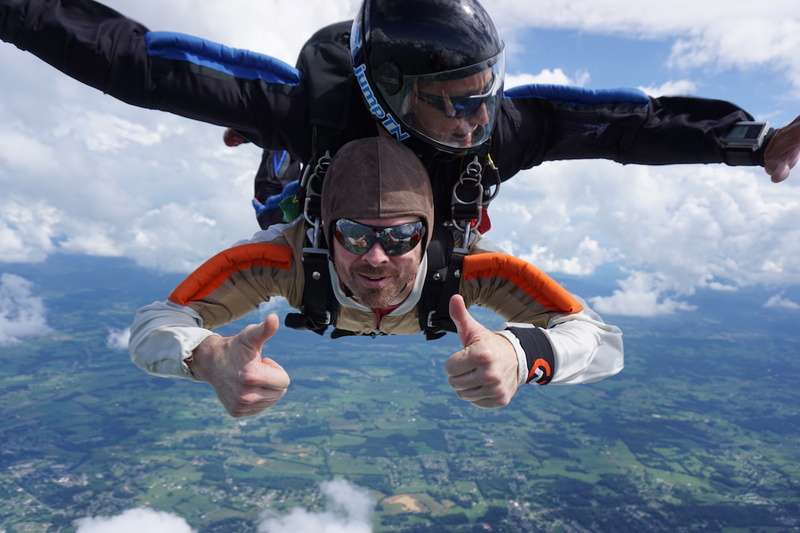 A tandem jump is the easiest way to experience skydiving. Our contractors want to give you the ride of your life, but they also want you to walk away having actually learned how to skydive. For your first time a tandem jump is the best way to experience skydiving and learn the basics of jumping out of an airplane. You will be connected to an instructor who jumps with you and guides you through the exit, free fall and flying your parachute to a safe landing on the ground. Walk-ins may have longer wait times based on the schedule. View answers to our most frequently asked questions here. Weather conditions are a major factor in skydiving. Unjumpable conditions may include but are not limited to cloud cover, high winds, or precipitation. In the event of weather, you may re-schedule your reservation for up to one year without forfeiting your deposit. In the case of weather, you may call us the day of your reservation to re-schedule for a future date. Call 423-765-5111 for same day reservations!